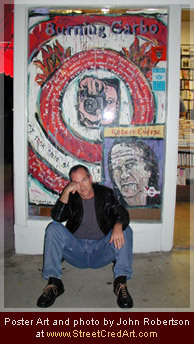 A graduate of the University of California at Santa Cruz and UCLA's MFA Program in Film, Television, and Digital Media, ROBERT EVERSZ pounded the mean streets of Hollywood for a decade before fleeing to Europe to write Gypsy Hearts, an expatriate novel set in Prague and Budapest, and his five novels about Nina Zero and the American Obsession with celebrity culture. Among other distinctions, his novels have been translated into 15 languages and have appeared on the critical best-of-year lists of The Washington Post, Oslo Aftenposten, Bookpage, the Manchester Guardian, and January Magazine. At least a part-time resident of Prague since 1992, he helped found the Prague Summer Writer's Workshop, now the Prague Summer Program, and serves on its permanent faculty. He has also lived, at various times, in San Pol de Mar, Spain, Morelia, Mexico, and Silvi Marina, Italy. In 2007, he judged the Association of Writers and Writing Programs' Award Series In the Novel, and is currently Writer in Residence at Western Michigan University.